What is Alpha? Alpha is a series of sessions exploring the Christian faith. Each talk looks at a different question around faith and is designed to create conversation. Each session starts with food, followed by a talk on DVD, then discussion in small groups. How much does it cost? It's free, although people may like to give a small voluntary donation towards the cost of the meal. Who is it for? It's for anyone who has questions, and wants to learn more about the Christian faith. When does it start? Thursday 2 May 2019. I'm interested, who do I need to contact? 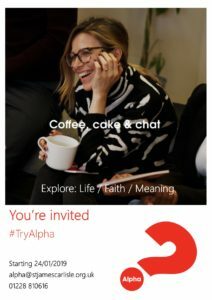 If you would like more information about the Alpha Course please email alpha@stjamescarlisle.org.uk or call Simon on 810616. Details of our Community Fun Day will appear here nearer the time. Join us for a Light Party - a positive alternative to the traditional Halloween Party. We will be joined by a professional children's entertainer.